Peegee Hydrangea: you’ve come a long way baby! 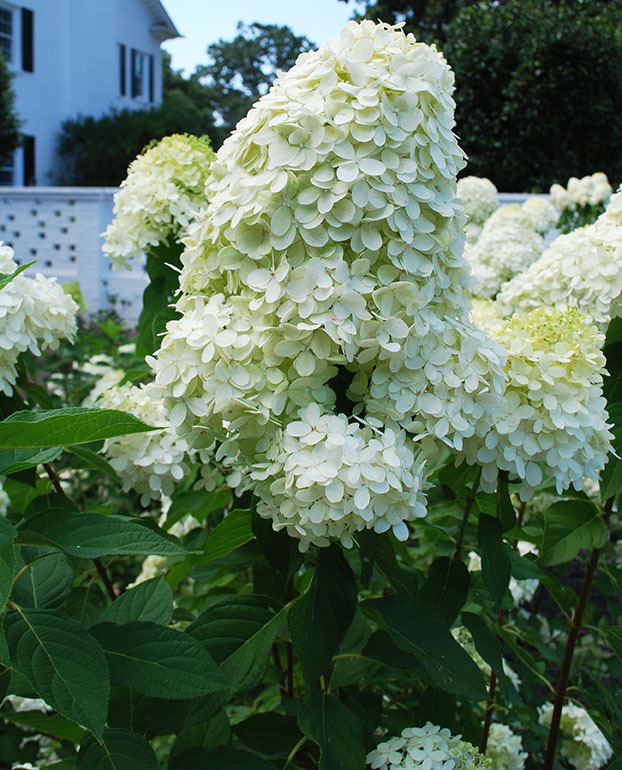 One of the toughest and most adaptable of all hydrangeas that tolerates full sun, Peegee Hydrangea (Hydrangea paniculata ‘Grandiflora’) is also one of the most coarse-textured shrubs that’s difficult to incorporate into the landscape. ‘Grandiflora’ is a deciduous large shrub or small tree that grows 15 to 25 ft. high and 10 to 20 ft. wide with a fountain-like habit. Panicles of creamy-white flowers produced on current season’s growth open in June, July, and August; they age to a bronze-pink and eventually tan-brown. Since flowers occur on current season’s growth, prune as needed in late winter to early spring. Recently plant breeders embraced this species and created more than 80 cultivars that embody the ruggedness and durability of panicle hydrangea (H. paniculata). These cultivars look nothing like your grandmother’s Pee Gee hydrangea. The come in various shapes, sizes and colors. Several outstanding cultivars that you should include in your landscape include ‘Brussels Lace’, ‘DVPpinky’ Pinky Winky®,‘Floribunda’, ‘Interhydia’ Pink Diamond(tm), ‘Kyushu’, ‘Lammetje’ Little Lamb, ‘Pee Wee’, ‘Tardiva’, ‘Unique’, ‘White Lace’, and ‘Webb’.